Perfect for your simulation center. The CareAssist® ES Medical Surgical Bed provides essential and dependable technologies for delivering effective quality care. The CareAssist ES Med Surg Bed provides easy to use solutions to help caregivers manage patient safety, comfort, and positioning. With its transport capabilities and easy maintenance, this med surg bed meets the fundamental needs of the care setting. This bed is designed to be moved safely and easily. The raised headboard allows caregivers to stay in upright position while they push the bed. Stopping is secure with the central locking system with 4 casters locking in 2 different directions and a single press to the CareAssist brake system. Alert with sound if brakes are released and be is still plugged in. 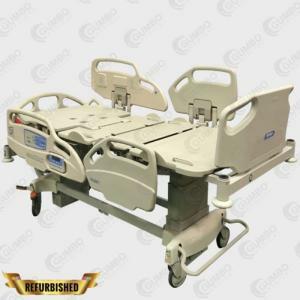 When transporting a patient, this bed can operate without being plugged in using the standard battery back-up feature. Ordering information: Additional features and models may be available. Please contact your sales representative or customer service for information. This is a large item and will require freight shipment. Additional shipping may apply. Caution: This bed is refurbished and is intended for educational and training use only.